Tesla Brand Polarized Driving Glasses. Tesla should sell their own brand of polarized, night time driving eyeglasses. I see the double vision (ghosting) through the windshield of my December delivered X90D. When I wear real polarized eyeglasses the double vision is almost gone. Most cheap "polarized" eyeglasses don't really have polarized lenses. All my good polarized eyeglasses are too dark for night driving which is when they are needed. I have good polarized camera lenses that are not too dark. How do we ask Tesla to sell (or recommend a brand of) Polarized Driving glasses? I don't know but I sure would like a pair because the ghosting really annoys me. I didn't know polarized glasses (non-sun) are even available. That's good news if polarized glasses help. Maybe a polarized film or treatment could be applied to the windshield. All good polarized lenses need to reduce the light through the lens by half. That's the physics of what polarized camera lenses do. All the polarized eyeglasses seem to also add a dark tint filter usually with added color. The Pro Bass Shop has dozens of polarized fishing glasses but doesn't sell polarized glasses without added tint. The Pro Bass Shop sales person can't imagine that anyone would buy polarized glasses without tint. I what 'polarized camera lens' type lenses in my glasses. eric.zucker: "Maybe a polarized film or treatment could be applied to the windshield." Tesla might worry that the windshield would be too dark, but a laminate layer might not be too dark. The good news is the image would pass trough the polarized film THREE TIMES as a middle laminate of the windshield before it made a double image, and five times before the third image. Image ------> / --> / --> True image (> Driver's eyes. This means that even a weak polarization of the film inside the laminated windshield could have a major attenuation to the false images. Which implies the windshield only needs to be a tiny bit darker. On the other hand the eyeglasses (like the coating on the inside of the windshield) only get one pass of the image through the polarization to reduce the False images. The dotted lines are where the laminated polarization film should be in the windshield. Go to the Zeiss web site and look for the DriveSafe glasses. particularly for LED and HDMI headlights. @JAnnen: as light bounces off a boundary between different refraction index materials if becomes polarized. If you have a properly oriented film if can block the reflection almost entirely. @eric.zucker: Yes, I agree. A polarized film on the inside of the windshield would block the unwanted reflection almost entirely. That's how the polarized eyeglasses work and they work well. The problem is half the light would be rejected making a darker windshield just like the sunglasses. I'm suggesting a film with a weaker polarization would work just as well if it were inside the windshield. The unwanted double image would pass through the weaker polarization film three times. 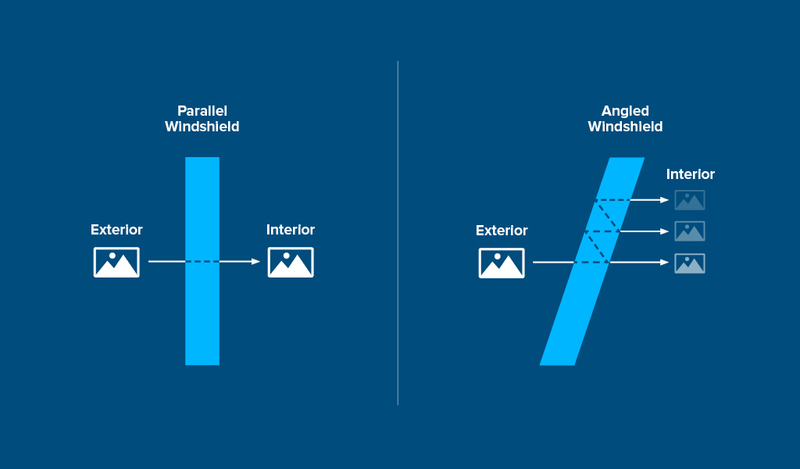 This means the windshield with the weaker polarization film inside would allow 84% of the light through (instead of only 50%) while reducing the unwanted image by the same as the darker sunglasses. @jwspicerjr: Thanks for sharing. The Zeiss web site says the DriveSafe glasses "With DuraVision® DriveSafe Coating: up to 64%** glare reduction." No polarization in the DriveSafe Coating which reduces glare by filtering out blue light. The Zeiss Polarised Skylet® "combines a polarization filter with contrast enhancing Skylet® tinting." Reading the article you posted makes me wonder what Tesla is doing about problem windshields like mine and yours. This statement from the article: “Reflections (ghosting) occurs in all laminated glass to varying degrees,” a Tesla spokesperson said in a statement. “We have received only a small number of questions from Model X customers about the windshield and have taken action to address these unique cases.” isn't consistent with my experience. I complained about it to my SC shortly after I got my X last spring and and haven't heard a word about it from them. I like your side of polarized driving glasses if they could be made to let enough light in during night driving. Seems Tesla may not do this though if there would be a possible liability risk to them if people who don't wear them get in night time accidents. I was trying to find a solution that didn't require replacing the windshield. I'm not fond of driving glasses, as I already wear prescription glasses. This may however work for those can wear them and really find it too bothering. When I do sports, I usually wear contact lens, so that's when polarised sunglasses might work for me. Tinted front windows are illegal in my country, that would be a problem for the polarised film workaround. Maybe the ghosting on my car is less severe, It's certainly not that bad. My eyes are very susceptible to light, so you won't catch me outside without sunglasses on. I've tried all the usual brands, so I'll give my two cents on a few. Serengeti - good clarity, but all of my lenses scratched way too easy. For the money, I prefer other brands for this reason. Smith- Awesome lenses, and their frames fit me the best. Some of their frame finishes can peel after long term use. The The Hook Titanium- This is what I currently have. The lenses are outstanding and durable. Frame is light and seems durable so far. I love my The Hook Titanium, but prefer Smiths simply due to their frames fitting my fat head a little better. You can't go wrong with the lenses of either. And I'm always the go to night driver, and I was Mr. Night shift during my time in the service (https://bestreviewsbase.com/best-sunglasses/#Best_Sunglasses_for_Fishing). Owls really aren't that bad. I always drive with my Maui Jims. My polarized Oakley pair, which I initially bought for bicycling, works well. I can look straight to the radiating sun through the panoramic windshield without any squinting. Camera lens manufacturers have it really bad with multiple lens surfaces. They use multi-layer coatings to reduce reflections and glare. Unfortunately, this will not work on auto glass because those coatings are rather fragile, and will damage and/or rub off rather easily. Polarizing does introduce the neutral density darkening factor, and for night driving may end up being too dark, let alone not being legal in some states. Hopefully someone will come up with a polarizing filter scheme that will not involve the darkening factor. By the way, Jim Jannard, who founded Oakley, sold it, and now runs Red Digital Cinema, and may still be a source of information.